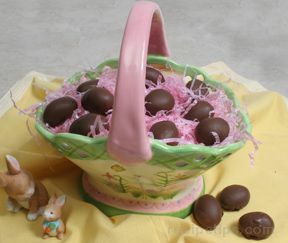 These chocolate covered Easter eggs have creamy peanut butter centers that make them hard to resist. 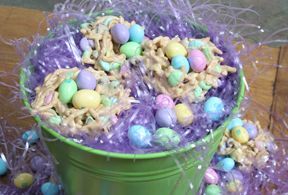 Add these Peanut Butter Easter Eggs to a homemade Peanut Butter Easter Nests for an extra special Easter treat. 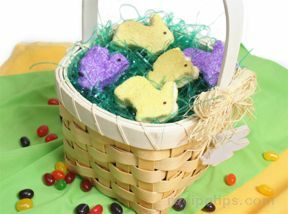 Gradually add in the powdered sugar until it is all added and mixed in evenly with the other ingredients. Cover and place this mixture in the refrigerator to chill for 2 hours. 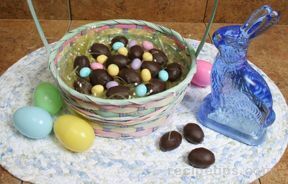 While the eggs are chilling, melt the chocolate chips in the microwave. Microwave in 30 second intervals, stirring after each so the chocolate does not overheat. When the chocolate is almost all melted, stir vegetable oil into it. Heat another 20 seconds and stir until all the vegetable oil is mixed in and the chocolate is silky smooth. "Yum! These were excellent. They reminded me of Reeses Peanut Butter cups."